More like Funky Duck – Look at it’s Fro and subtle pimp cane! Progressive rock is not easily definable. This sounds like a cop out, yes, but I do think that part of the intrigue of this genre is its obscurity. For the sake of continuing this post, I will attempt to define this genre that peaked in popularity during the 70s. Progressive rock (similarly to psychedelic rock) took classic rock and expanded it. It manipulated compositions, added instrumentation, and made music unpredictable. I do think that one of the reasons why bands like the Mothers of Invention, The Beatles, The Beach Boys, Jethro Tull, The Moody Blues (the list goes on) started experimenting with different music was because they were bored. As the progressive rock movement spread (prior to the genre being termed), more and more bands sprouted up – many that are underappreciated (i.e. The United States of America, Gentle Giant, Amon Duul), but even many of those bands became cult sensations. Today we are going to talk about a band that missed the boat entirely, never gaining much fame with their unique brand of progressive rock (I’ll save a more in depth analysis of my love for progressive rock later – the genre does house my favorite band of all time Pink Floyd). So may I introduce to you the one and only hairy fowl and introduce them to the obscure classic rock section of our humble castle. 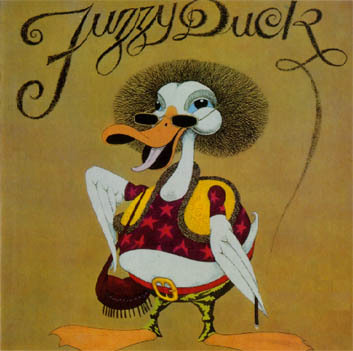 Fuzzy Duck – yes that is the cover of the band’s eponymous first album (and what an album cover it is) – was formed in London in 1970 and it featured a few train-hopping musicians who experienced progressive rock from the perspective of a few oddly named bands. The original line-up consisted of guitarist/vocalist Grahame White, bassist Mick Hawksworth (formerly of Andromeda), keyboardist Roy Sharland, and drummer Paul Francis (formerly of Tucky Buzzard). Just before the band’s first and only album was released White left and was replaced by guitarist/vocalist Garth Watt Roy who was featured on the bands two 1971 singles before they all parted ways by the end of 1971. In a way the short life of Fuzzy Duck feels like the relationship between Brenda and Eddie from Billy Joel’s “Scenes From an Italian Restaurant” – where the couple gets married during the summer of ’75 and has had it already during the same summer (and get a divorce as a matter of course). But before the band parted the closest of friends (okay, I’ll stop with the Joel references), they did release some music and I want to highlight two of their songs (tracks 1 and 2 on their album) in this post. The song begins with a groovy 70’s riff over drums and harmony. As the song progressed we are introduced to a few elements that are identifiable as progressive rock. The tremendous organ solo at around the 1:40 mark is a classic signifier. Sharland kills it during this intense solo. The song (4:10 mark) also uses production techniques like displacing sound – another element that progressive rocks played with. A fuzzy guitar solo follows and leads into the choral harmonies that persist throughout the song. One of my favorite parts of this song is the skilled bass of Hawksworth. A solid bass can do more than simply carry rhythm and in “Time Will Be Your Doctor” it makes the song. Many view etheriality and airiness as two elements necessary in progressive rock, but this is simply not true. Progressive rock extended way beyond that realm – as proven by Fuzzy Duck and many other bands. “Mrs Prout” immediately hits listeners with a wavy guitar that oscillates through different speakers and a strong rhythmic bass. It feels like early Progressive/Hard rock that did go on to inspire future hard rock/metal bands. An eerie alien keyboard leads into the beginning of a fine vocal by Grahame White. The song continues in this vein for a good amount of time – a constant, complacent beat. At around three minutes bass and drums begin to take the song over and a guitar quickly decides to join in on the impromptu jam that is funky and excellent. An organ rises and begins to drown out the small jam – and this continues until the end. I love the instrumental portion of the song. I feel that Fuzzy Duck’s true strength is there as well. It’s sad that these guys didn’t get a shot at notoriety. They’re not half bad. I hear similarities to Cream and Amboy Dukes and a bit of what The Doors tried to do before Jim bit the big one. I guess bigger names crowded them out of the genre. I absolutely agree. I believe that the plethora of “big names” and great bands during Fuzzy Duck’s lifespan made their plight a difficult one. As a fledgling prog rock band at a time when bands like King Crimson, Yes, The Moody Blues were producing lasting hits, they truly drew the short end of the stick. Lot of Tull in the second song, very good song. Great call with Deep Purple. You can really hear many influences in this music. Hi Matthew. Many thanks for the Fuzzy Duck piece. This is yet another band that I need to investigate further. Cool sound with a great rhythm section. There’s some really nice interplay between Hawksworth and Francis. Thanks Todd! The rhythm section is absolutely one of the band’s greatest strengths.